Being aware of the historical importance of this instrument, its extreme rarity and its relatively badly preserved shape (successive repairs, numerous woodworm tunnels, etc.) the owner of this guitar would like to arrange a study of the future of this rare testimony, the instrument’s maintenance, along with possible restoration and its preservation. These guitars are listed and thoroughly described in various publications except for the “Vuillaume”, kept in the Musée de la Musique de la Villette in Paris. It cannot be found in any comparison chart. The “Vuillaume” was found in the collection of the illustrious Jean-Baptiste Vuillaume, a violin maker who was rather unpopular among museum administrators. This provenance cast a suspicious cloud over the guitar’s authenticity, just as happened with the violin “Le Messie” also made by Antonio Stradivari and which comes from the same collection and is now kept in Oxford. Just as any Stradivari instrument, the Sabionari has been modified in order to keep up with the latest instrumental practices and turned into a six-string guitar around 1800. The neck has been changed and the panel on the head bearing the prestigious signature has been carefully re-integrated into a new “palette” head. Braces and linings have been added on the back. The bracing on the soundboard has been altered as well: the struts on the upper part of the belly as well as those crossed under the rose might be original. Two struts on the lower part have been added. G. Marconcini (1) initiated the first alteration. The head’s and the bridge’s designs are very similar to those used by the skilful luthier for his guitars. Besides, the owner of the Sabionari at the time lived in Ferrare the town where Marconcini worked and it is only reasonable to assume that the owner entrusted his precious instrument to a competent and renowned luthier residing in his town. - re-establish its original function and make it available to some soloists in a reasonable way so that we may retrieve and study the timbre of Stradivari’s guitars. The other guitars made by Stradivari which are set aside in public collections are only destined for exhibitions and silent observation. This one dates from 1679. It is the oldest guitar and its resonant box – still in its original size – would allow playing the baroque repertoire on a baroque instrument, finalized by the most famous luthier, and whose size and style differs considerably from other fully-preserved baroque guitars today. Before deciding on a strategy of restoration and contemplating on the actions – most of them being irreversible – let’s read again the article written by Pollens (2) and Gregori (3). Their article is about a study of these instruments and the comparison charts they then assembled. Thereby we can see that the size and measures of the Sabionari are the same as those of the “Hill” and the “Giustiniani”. We observe that Marconcini kept the triangular character of the original heel which he reproduced on the neck. Therefore we might think, through a reverse inference, that the Sabionari, as well as the “Hill” and the “Giustiniani”, originally had a distinct triangular heel, even if this is not the case with the separate neck which is kept in Cremona. According to Gregori, the edge purfling, bones and blackened wood do not seem authentic. We do not actually find a convincing argument confirming or disproving his conclusion, but replacing the “perhaps” non-original purfling with a non-original one, would not further jeopardize the belly and at the same time it would not achieve anything either. Still comparing the Sabionaris’ proportions with the others we realize that it has the same measurements as the “Hill” and thus must have the same long string length: 74 cm – diapason. Among the still existing but unidentified baroque guitars such a big diapason is quite rare and might be one of the specific features of Stradivari guitars. We do not agree with Pollens and Gregori, and think that the neck, the head and the fingerboard are completely apocryphal and can be replaced. Since we lack sufficient experience with Stradivari’ varnish concerning guitars and violins, we line up behind the experts and consider the present varnish as the original one. A study with a Woods’ lamp clearly shows the retouches in places where the wormholes have been filled and a whitish orange varnish on the rest of the body, quite comparable with the UV results of the “Giustiniani” (4). Furthermore we notice that in contrast to many other Italian baroque guitars, none of the Stradivari guitars has been changed into a “battente”- model with an angled table, a moving bridge and metal strings, secured on bone pins in the central panel at the lower rib junction. We also have to consider the complex problem of the bracing. Guitars from that period usually have a strut free back which is at least 2 mm thick and there is no lining. Two struts can be found on the soundboard, one above and the second below the sound hole and sometimes two crossed smaller struts on the lower part of the belly, relics of old bracings. In order to re-establish the “Sabionari’s” initial interior we would have to open it, remove the struts from the back, check the struts of the belly which are not worm-eaten and take off the anachronistic struts of the belly’s lower part. Given the upcoming tension of the long strings, the worm holes that cross the back lengthwise and the big size of the guitar, it would be too risky to remove the struts from the back for the future setting of the strings. On the other hand it is highly problematic to open the guitar because worm holes can be found in the linings and the ribs and even if most of them are filled and patched, they are still numerous. Finally without reliable and authentic models there is no point in contemplating the modification of the bracing. We x-ray the instrument to get a closer look at its state and at the repairs. The results come as no real surprise since it is possible to directly observe the instrument via the sound hole which is big enough to let a mirror through and because of the absence of a parchment rosette. Nevertheless we discover a third nail located at the very end of the original block. Sacconi (5) mentions that Stradivari used three nails for his violins and five for his celli. We can assume that Stradivari constructed his guitars with a big diapason with three nails. A question comes up though: Is the heel made of the same block as the neck, beneath the veneering, as it is the case with the quartet instruments? Do the three nails hold it? Or is the heel made of a different block adjusted against the grain to the neck, like it is done in the construction of lutes? We think that the heel is made of two against the grain pieces, just like lutes and mandolins even if, as far as we know, nobody tried to detach a small piece of the heels veneer for verification. A comparison between the Sabionari and the Giustiniani via x-rays reveals the same high square heel (modified on the Sabionari), fairly similar struts on the upper part of the belly and those situated on the sides of the sound hole. The lower-block is also the same. The previous repairs, although they do not allow to keep the guitar in its strictly original state, that is without struts on the back and on the lower part of the belly, may be maintained for the worm holes have been filled. Thus the repairs are now solid and long-lasting. They allow restoring a baroque neck and head. The belly is in an excellent state. Its average thickness is 2.3 mm, which is conventional. It never has been drilled for the setting up of six strings and allows the setting of a bridge for five double strings. To avoid further risks, we and the owner of the Sabionari have decided, according to the principles of the patrimonial masterpieces restoration, that there is no need to open the box whose ribs are very distorted. We have therefore renounced on a “see for yourself” examination of the inner parts which would have been fascinating and enriching. Instead we have chosen to build a copy of the “Hills” neck and head whose sizes are the closest and to re-insert the panel bearing the Master’s signature. This important work could be called ultra-interventionist not to say relentlessly technical/ therapeutic and we postpone it to a later date. We do not give in the syndrome “Il Canone”, Paganini’s violin made by Guarneri, kept at present in Geneva, and owing its name to his powerful sound. So far, “Il Canone” has intrigued every violin maker who got close to it and it probably is, in the attempt to reveal its secret, the most frequently opened instrument in the history of violin making. We know that many guitars have been built in Cremona, made by Stradivari as well as by Amati and Guarneri and numerous documents from the museum of Cremona testify Stradivari interest in instruments which do not belong to the quartet. For instance a lot of head gauges, drawings and templates, etc. 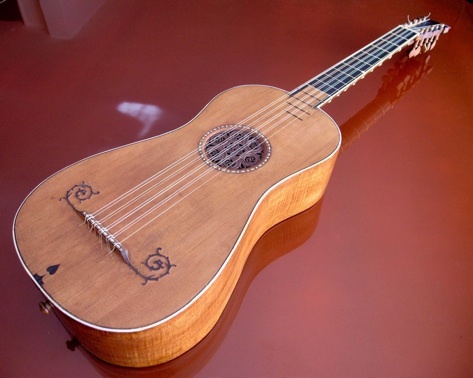 About 1680 the guitar is very in vogue all over Europe and we will add other baroque guitars to the comparison chart of the Stradivari guitars. 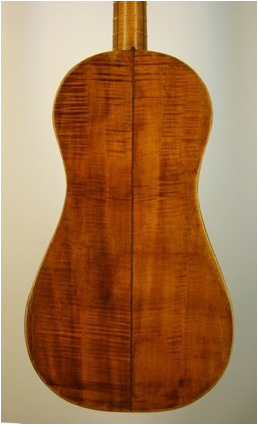 Many of the Cremona guitars did not survive their time because the simple material: maple, spruce, wood purfling and missing sumptuousness decorations, plainly did not seduce the collectors. We take off the Marconcini neck (neck/ heel are made of one block as for a quartet instrument) and we withdraw the two nails (the third had been cut during the 19th reassembling and completely set into the original block). This operation exposes numerous wood worm tunnels which, strangely enough, were not shown during the x-ray. The tunnels are very large and have extremely weakened the neck’s thickness and his solidity. Furthermore we notice that the rib structure closes under the neck, like on a violin. We continue the lecture of Sacconis article and find out that, for his b/w/b purfling Stradivari used black coloured pear of 3/10 thickness and 6/10 poplar for the white parts. The black purfling is not made of ebony but of black coloured pear and the white parts are in poplar, however the dimensions differ decidedly. Once having checked the drawings of the “Rawlins” and the “Hill” we note that the purfling thickness vary on each guitar. Therefore we decide to make the purfling in order to match the neck to the dimensions of the box. The “Vuillaume” in Paris, is the only survivor made of humble materials and is spontaneously constructed. This guitar evokes a “bottom of the range” instrument affordable for a common musician less rich than most of famous luthier’s customers. Many quartet instruments, whose resonant box is made of poplar or another modest wood of the country, confirm this observation. Its date of construction is indefinite because Stradivari did not finish the panel. But the dendrochronology defines 1659 (6) for the earliest ring which could place its creation somewhere between 1670 and 1690. (It would be necessary to compare this with the violins dendros: How much time did pass between the last ring and the date on the label and how long between the cutting and use of the wood?) It seems that Stradivari kept some of the woods during 29 years for drying before he used them – see dendro of the “Messie” (7). The resonant box is made of cypress, a wood that was never used in the violin making craft in Cremona though quite common for guitars with very high ribs. The black wood that is veneered on the neck, the head and the fingerboard is not ebony but a strange black, very fibrous wood: of bog oak (8). The neck’s purfling is made of maple. This guitar has been opened many times by removing the back and the belly. The belly’s edge purfling derives from a rarely used model; it is in a perfect state but apocryphal and has been added during the closing of the belly. 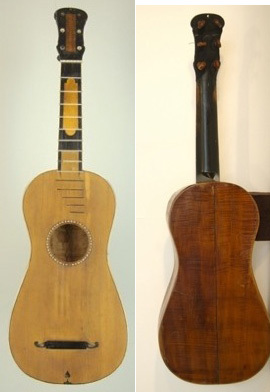 Although the wood rose prevents the direct observation of the bracing, the restoration photos (endoscope) clearly indicate that the guitar has been re-set in the 19th century with six strings, with a six pegs bridge piercing the belly. Then it has been re-set with five double strings without any modification on the head. They also reveal completely anachronistic fir tree linings and 19th century struts on the belly and on the back. The head is made of poplar (or weak walnut), (the other guitars, except for the “Rawlins” were made of exactly the same wood), veneered with this black wood. The fingerboard’s edge purfling is bone-made in order to reinforce the side of the fingerboard which is always damaged by the frets. The bridge as well as the unlikely lined pegs is a contemporary work. The whole guitar has endured a drastic cleaning during the last reassembling which kept it with almost no varnish (traces) but an orange colour. In our opinion the “Hill” is the most beautiful and pure guitar that has survived. It comes from the Hill workshop whose restoration skills and expertise are unquestionable (just like the Vuillaume workshop). The engraving on the panel matches those of the Sabionari, Giustiniani, Vuillaume, Hill and the Rawlins: a specialized craftsman engraved the text using a template and stopped at the year’s first number. Then the master engraved the last three numbers to complete the date because they differ in texture. From one panel to the other, all the letters are made of an identical design which can only be achieved with a template. The procedure is simple: once the drawing of the letters is finished, they are hollowed out with a sharp tool and then the channels have to be filled with black mastic. The same method is used for the sound hole and the bridge. 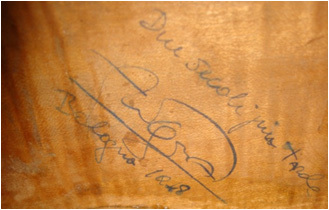 A similar principle is found on violin labels, the “1″ is printed and the following numbers are handwritten. The guitar is in a magnificently fresh state with its beautiful fine bright orange varnish. The belly has once been removed. This indicates the work of a violin maker. 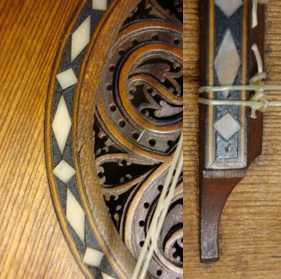 The coloured edge purfling was replaced to some extent by ebony during the closing. The back has never been undone from the ribs and the vellum which replaces the linings is intact. There are no struts on the back. The bracing on the belly is out of reach but seems to be coherent. The very beautiful rose prevents any examination and here, as well as in Paris, there is no opportunity to x-ray the instrument in order to look at the inside. 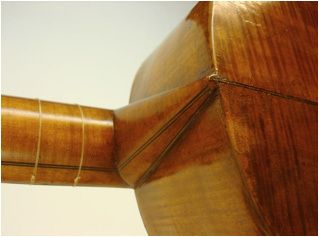 The changing of a Stradivari’s bracing is a common procedure, only a few instruments can boast their authenticity. And what other reason might have been there for opening the guitar than to change the bracing? 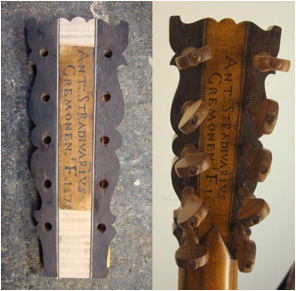 The inside of the instrument is quite clean and Stephen Barber noticed a restorer’s initials “JW”, dated 1914, under a strut of the belly which confirms the complete opening of the guitar. As on the Vuillaume, the Giustiniani and the mandolin the “Coristo” (9), the black wood of the head and fingerboard is made of this strange black wood called bog oak and not of ebony. A similar type of wood is still used and sold in Germany but we do not know if it is the same wood Stradivari used to work with. Nevertheless, this confirms that ebony was rare in Cremona at the time and thus it was replaced by coloured wood: oak, pear, boxwood etc. Another scarce substance in Cremona was ivory and the small white ornaments that can be found on violins (for instants on the violin kept in the Ashmolean museum) and on guitars are made of bone and not of ivory. The “Hill”s head is made of poplar or Italian walnut, veneered with this bog oak and embellished with bone purfling, as on the Vuillaume. Its pegs are copies of 18th century Neapolitan pegs; we bet that the Hill workshop was inspired by one of the pretty mandolins that were part of their collection. The bridge however is probably authentic. The materials especially the purfling and the black paste which embeds the small bone pieces, are exactly similar, in pattern and in size, as those around the rose. The triangular tunnels lining the strings show a significantly diligent work and the elegancy of their design speak for themselves, even if the traces (they are hardly visible) left by the missing moustaches indicate that the belly has been aggressively cleaned. The frets on the fingerboard have been subsequently added. Through the end pin hole in the lower block, we were able to observe that the neck, as on the Sabionari, is held by three slanted nails so that they do not split the block. Along with the Vuillaume and the Giustiniani, the “Hill” has two small filled holes that were necessary to fix the resonant box to the mould during construction. They also have the triangles in common which delimit the playing area at the belly’s upper part. Besides they also share the inverted hearts on the front’s lower part made from this mysterious wood. We wanted to build a copy of the neck and head using the “Hill” drawings from the Oxford Museum, made by Stephen Barber in 1978. We took small templates along with us which we had produced from the drawings. But as soon as we put them on the neck we discovered that they did not entirely fit. The outlines were not really matching the original. So we changed our templates according to the authentic “Hill” neck. In addition we also took paper templates of the heel and its typical triangular profile. We also built a copy of the Hill’s bridge. We do not agree with Stewart Pollens and think that the bridge is most likely authentic. 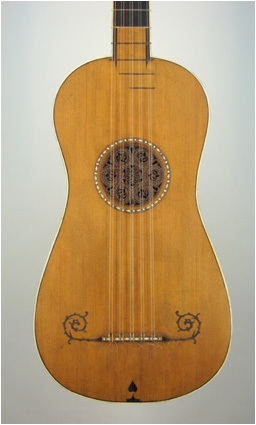 The long delicate baroque guitar bridges, pulled by ten long stretched strings, usually come undone and are often lost. The procedure of making holes is above all used in the 18th century, especially in France but it is quite possible that it derives from Cremona. If a bridge template or drawing only shows small points instead of triangular string holes, it means that the luthier simply indicated the uppermost end of the holes; just as pegs are pointed out by small spots on head drawings. He then hollows out the holes when he assembles the guitar. This enables him to leave a huge surface for gluing, more resistant to the string tension, and also to give the guitarist the possibility to tune his instrument. This model surely is atypical but Stradivari is known to be innovative and might have designed this model. On the other hand, if Hill had built a new bridge he probably would have used ebony, just as he did with the purfling on the outline of the belly and he also would have replaced the bone with ivory. As for the choice of material and its dimension, the decoration is exactly the same and most of all the black mastic is not gum lack but a delicate mixture difficult to reproduce. and those missing on the “Hill”. 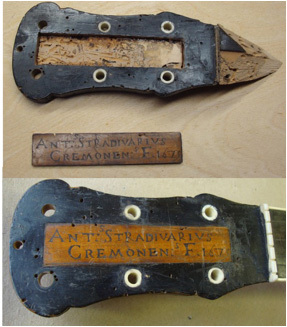 It is interesting to notice that, in Cremona, Stradivari did not use ebony on his guitars or on his mandolins. He uses every material coming from the abattoir: gut for the strings, bones, tendons, skin and also hoofs which are used for making glue, as well as some putty, bones that replace ivory, bow hair and who knows what else. In our opinion, the mastic, with small sunken bone pieces, is made of burnt bones – like the black ivory mixed with glue which produces a black, slightly dull, but fine and smooth paste once being polished. He was Storioni’s apprentice and opened his own workshop in Ferrare. His work is well known and appreciated unanimously. His father, Luigi Aloisio, 1760-1791, was a pupil of Omobono Stradivari and there is a great demand for his work as well. in Cremona for 29 years. black colour; this wood was used in Cremona and all over Italy in the 17th and 18th century.